Most athletes view the treadmill as a temporary alternative when conditions don't permit outdoor running. The treadmill, however, is an important tool to improve running performance and fitness because it offers the option to incorporate hill work into your training in a safe, controlled environment. The hills found outside aren't necessarily ideal for training. 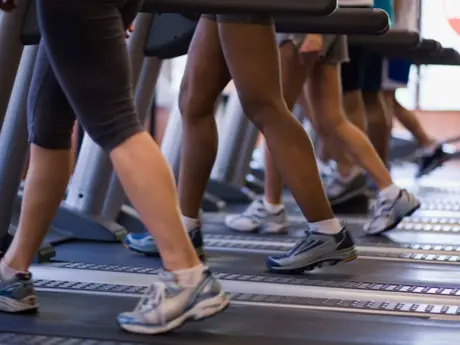 The treadmill allows a runner to easily change the incline from a short, steep hill to a long gradual incline depending on his or her specific goals or needs. RRCA-certified running coach Melissa Cox explains how treadmill hill workouts are beneficial to athletes at any fitness level. "Many of us are surrounded by hills that seem daunting—either too long or too steep—and avoid them all together," she says. "By being in control of the incline, length of the interval and speed, runners can introduce hills as they feel comfortable, and progress any of the variables as they feel ready." Running hills requires the use of more muscles than running on flat surfaces, and forces a runner to expend more energy. Taking your workout from a flat surface to a hill will help to strengthen the glutes, quads and calves. In addition to the higher calorie burn, targeting these muscles can help to improve stability and running performance. "Beyond preparing you for a hilly race, running hills can provide metabolic, psychological and biomechanical benefits for all runners," Cox says. "Uphill running improves aerobic capacity, allowing for enhanced utilization of oxygen and, therefore, improved running economy." Running uphill places different demands on a runner's body, which can help to improve an athlete's strength and running power. The use of more muscles, and an increase in cadence are required to push up the incline of a hill, which translates into speed gains and improved running form. "By focusing on a strong posture, increased hip flexion and shorter, quicker steps, a runner can improve strength, form and, therefore, efficiency," Cox says. "Running hills will quickly translate into improved cardiovascular capacity, improved muscular strength and endurance, and increased speed on the flat road."